A Ruritanian Romance in the style of The Prisoner of Zenda by Anthony Hope, this one sees Tintin and Snowy enmeshed in the political machinations of a small Balkan country which is riven by internal strife and coveted by a militaristic neighbouring country.According to the Tintin website, Hergé partly based this story on the Nazi annexation of Austria, though it's not giving too much away to reveal that our young hero foils the plot!.Hergé's well into his stride now and the adventures rattle along. 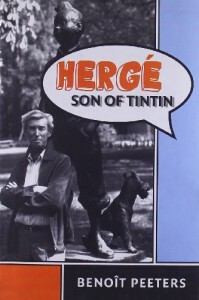 The usual car and plane chases take Tintin across Europe at an incredible pace, but Hergé does remember to make his hero feel hunger pangs after being out in the mountains all night: nice touches of realism like this help to balance out the amazing, but necessary and expected, coincidences that crop up. And how come Thomson and Thompson are the only detectives anybody calls in to investigate anything, anywhere, despite their obvious ineptitude? Wacky Belgian humour! !We get our first introduction to opera diva, Bianca Castafiore, and I'm looking forward to Captain Haddock's first appearance in the next story, The Crab with the Golden Claws.